This system is designed to maintain two independent navigation systems simultaneously. 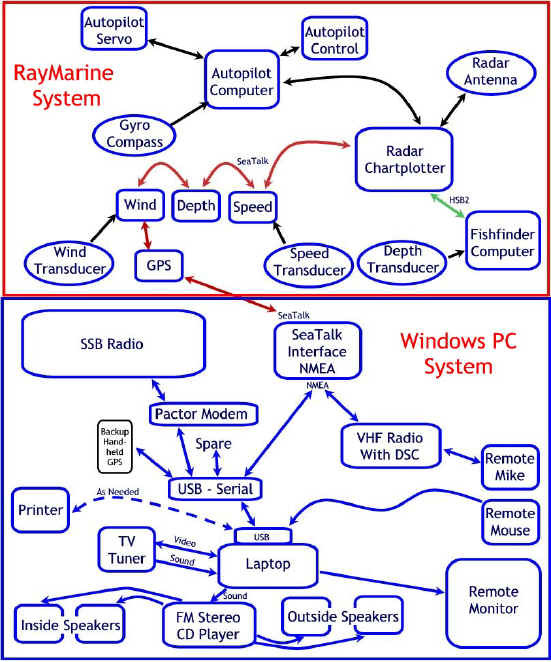 Under normal configuration they use the same GPS input, but with a few mouse clicks the PC can receive its input from a handheld GPS, and both the GPS and Computer can run for over an hour on their internal batteries. A backup computer is carried with all the charts and software so a different computer can be swapped out in a few minutes if necessary. A secondary monitor is mounted behind a window so the computer screen is visible in the cockpit. Since this uses a traditional monitor it is not easily visible in bright sunlight. The companionway hatch has a waterproof transparent map drawer that displays a paper chart to the cockpit while keeping it dry.